When Brightcove relocated our worldwide headquarters from Cambridge, Mass., to new offices in Boston’s Innovation District, we took the opportunity to continue our relationship with the DeCordova Sculpture Park and Museum’s Corporate Program. As part of the program, the local art institution loans paintings and sculptures to Brightcove for display in our new space. DeCordova staff recently completed installation of a number of new pieces throughout Brightcove’s headquarters, which were designed with the intention of displaying art throughout. Brightcove employees had the opportunity to cast votes for the works they liked most, and a team of volunteers from across the company helped choose locations for each of the pieces. 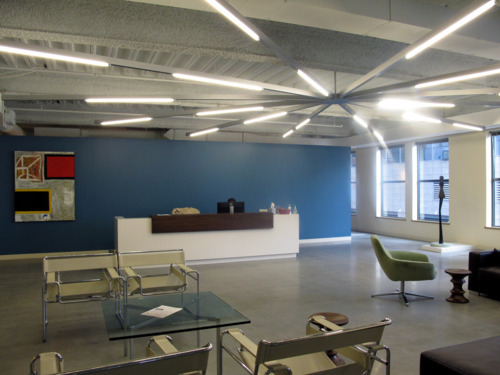 Following the installation, Brightcove CTO Bob Mason was interviewed for a DeCordova blog post on its Corporate Loan Program site, in which he discussed the design process and the importance of art in the workplace. The full interview is available on DeCordova’s Website. Brightcove's new headquarters were designed with the ability to display artwork in mind.